Located in Kottakal, the ideal geographic location of Kerala. Its salubrious climate has made external purification and rejuvenation therapies most effective for treatment of many psychosomatic disorders. Sri P. S. Varier, scion of an illustrious family of Kottakkal in the Malabar region of Kerala, was an extraordinary man. He was a multi-faceted personality: a renowned Ayurvedic scholar and academician, an able practitioner; a successful entrepreneur, and a genuine philanthropist... all at the same time! Sri Varier studied Ayurveda under the classical Gurukula system. He also acquired proficiency in the practice of Allopathy. In late 1902, Sri Varier founded the Arya Vaidya Sala, Kottakkal, for the preparation of authentic Ayurvedic medicines. The rest is history. Today, Kottakkal Arya Vaidya Sala is a name synonymous with Ayurveda. A name that offers a new lease of life to the suffering humanity. 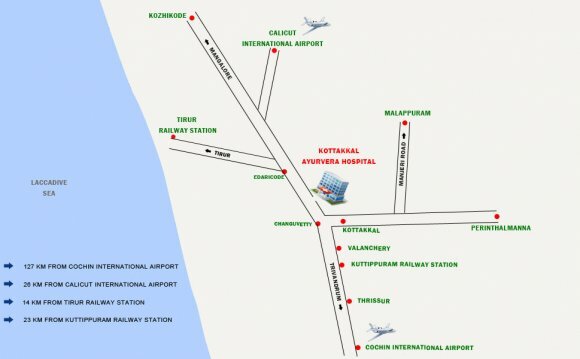 AVS manages Ayurvedic Hospitals at Kottakkal, Delhi and Kochi. All classical Ayurvedic medicines, therapies and expert medical advice are available there. AVS has two modern medicine manufacturing units, has well equipped quality control labs, has fullfledged research activities, publishes Ayurvedic periodicals and books, cultivates medicinal plants and conducts educational programmes. AVS also runs a Kathakali academy where the classical theatre of Kathakali is taught and performed. These treatments are specially effective in paralysis, rheumatism, arthritis, spondylosis, and other psychosomatic diseases. The classical therapies are also made use of, for devising new treatment modalities to deal with several serious ailments of the modern man such as parkinsonism, motor neuron diseases, cancer etc. Besides these specialised methods, the hospital offers Panchakarma treatments like Kashayavasthy, Snehavasthy, Nasyam, Virechanam and Raktamoksham. The centre provides organic food. White sugar, chilies and nightshades are not served.